Look what I found in the Keen 4 Demo! Is it certain that scuba-gear was a last minute decision? Although, the map design would seem to corroborate with this; the desert area of the Shadowlands is the only 'zone' which requires all it's levels to be beaten while others follow the the general theme of "two required, one optional". That Miragia was at some point of development an optional level makes a lot of sense. I thought the metal exit sign was an early attempt to tie the Shikadi more directly into the game (other than some misplaced council members, they left no trace). They might have planned for a high-tech or space themed level that was eventually scrapped or redesigned (possibly into Miragia). Miragia was always my favourite level purely for its clever design. It can't have been a rush job! theory is, that you were likely supposed to get to the top-right corner of the screen, where the gear AND an exit sign was located, and once you made a run for it, you'd hit the gear. that was likely scrapped, to make the rest of the level more mysterious and strange because you no longer had to explore all of the level, making it optional and thus good for completionists, while still retaining plus sides for speedrunners. Granted. You have just had a severe stroke. 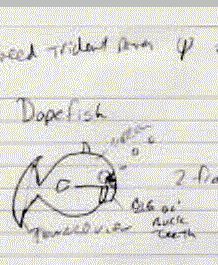 Wasn't there some concept art of the Dopefish floating around that had a note on it saying that some kind of trident power was necessary if you wanted to swim? They probably planned that the power was to be obtained in another level. Out of curiosity, is there any unidentified nonsense code that could be the cancelled parents sprites? Is it possible that there's some code left over in the demo that that was overwritten in our version that had the parents in there? It would be cool if it turned out we had the code for a couple sprites just floating around, but with no graphics. When I first saw the lack of unused tiles in the final release, my first thought was that they were experiencing memory issues and were trying to save space. But they still left at least some of the tileset info for those unused tiles. Does anyone know if the graphics are compressed in such a way that matching colors are grouped? Making all the unused tiles black would have caused that kind of compression to make the program a lot smaller. The method of scanning through MAPTEMP to find unused tiles and remove them started with Keen Dreams and was part of the strategy to fit the game onto a floppy disk. The tiles are compressed using Huffman compression meaning that a tile that is made of the most common pixels IS smaller than other tiles. However this is NOT the reason tile removal was done. Tiles, unlike all other graphic chunks can be totally absent, saving even more space. Modkeen extracts these as black tiles (And Keengraph as totally transparent.) but they actually contain NO data at all. In summary, it was done to minimize the size of the game files, nothing to do with memory. Location: On board the Bean With Bacon Megarocket. Its amazing what others can find in a game when they open it up to look inside. Its true that you can find out hidden secrets like hidden messages, images, unused code, or even debug and beta stuff locked up inside the hidden crevices of the game's code. Do you think its possible to use this newly found stuff in new Keen mods? Commander Keen wrote: Its amazing what others can find in a game when they open it up to look inside. Its true that you can find out hidden secrets like hidden messages, images, unused code, or even debug and beta stuff locked up inside the hidden crevices of the game's code. Do you think its possible to use this newly found stuff in new Keen mods? Entirely - extract the tiles from the demo and import that tileset into your project. "Hi, I'm Tom Sellick's moustache." Ya, but it still wouldnt really work if the tiles dont have any code to make them do anything. Additionally, many of the tile properties for these demo tiles can be found in the tile info of the full Keen 4 release. So, its just a matter of unlocking them? I wonder what kind of interesting and cool mods people can make using these new tiles. ...so, some time has passed since exploring this very exciting demo finds by K1n9_Duk3. Is/has there any chance of finding some parents related coding inside the demo code? And furthermore: Are there any news, whatsoever, on those other extra spirtes (like the BwB for eg.)? Has anybody ever talk to Tom Hall about those cleanups and leftovers? Last edited by Nisaba on Mon Oct 22, 2018 23:06, edited 1 time in total.